Magic Mist Auto Wash uses a HOT Water Wash and Spot Free HOT Water Rinses. Believe it or not, most car washes don't do this! It is common to apply the presoaks hot, but the high pressure (HP) rinse is typically cold water. Hot water makes a world of difference getting your car clean and looking good. View our Complete HOT Water Wash Packages here. 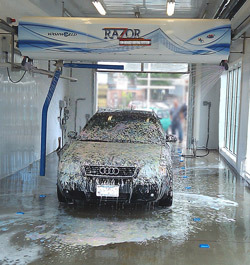 Magic Mist Auto Wash features the “RAZOR” fully automatic “touchless” auto wash with on board dryers to ensure your vehicle is thoroughly cleaned and completely dried. The “RAZOR” safely accepts all vehicles styles and configurations, to include: large SUVs, pick-up trucks, duallys and vans. Magic Mist Auto Wash also has an easy to use do-it-yourself pressure wash bay with state-of-the-art features, including a dryer, plus bill and credit card acceptors. No more filling your pockets with change to wash your vehicle, you can simply use $1 and $5 bills or your credit or debit card. If you need cleaning supplies or change, they are available at the entrance side of the building in our large glass front vendor. It contains a large variety of products to help you clean your vehicle, and has a change machine beside it.